Lazurite is a mineral of the rock Lapis Lazuli, other minerals being calcite and pyrite. I'm familiar with Lapis from my gemology studies, the finest quality grading out with no visible calcite or pyrite, just a deep rich blue. (Personally, I preferr to see pyrite veining even if the costliest, the rarest, is without.) It's common in the trade for lapis to be dyed, detectable by swabbing with acetone. Sometimes it is not even lazurite, but a simulation of dyed sodalite. 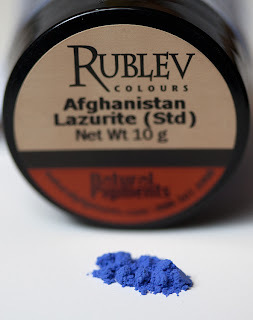 I was completely stunned to discover that the Ultramarine we commonly know of in our paints (with the exception of the very few paints that use natural lazurite, like Natural Pigments) is a true synthetic! Coloration can vary with differing amounts of sulphur but it's the real deal! Ultramarine blue is a color illustrious, beautiful, and most perfect, beyond all other colors; one could not say anything about it, or do anything with it, that its quality would not still surpass. And, because of its excellence, I want to discuss it at length, and to show you in detail how it is made. And pay close attention to this, for you will gain great honor and service from it. And let some of that color, combined with gold, which adorns all the works of our profession, whether on wall or panel, shine forth in every object.